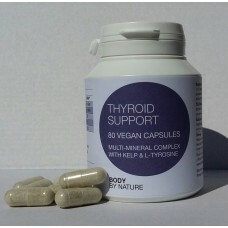 Thyroid support has been developed for those with under active thyroid gland. Thyroid Support contains L-tyrosine, an amino acid that the thyroid gland uses to make its hormones. Seagreens ® Ascophyllum nodosum is the organic kelp (a type of seaweed) species that we use in our product. It provides a natural source of iodine – iodine is needed for thyroid hormone production and is one of the micro nutrients known to be short in many people’s diets. Seagreens ® is a rich source of a range of minerals, vitamins, trace elements, amino acids, essential fats and antioxidants. Studies demonstrate Seagreens®’s nutritional value to be higher than seaweeds of the same species from the same location. Research shows that the iodine from Seagreens® is an ideal form which has a more prolonged and steady uptake than potassium iodide (the common form of iodine in table salt), with no adverse effect on the thyroid. Seagreens® carries Nutritious Food Seaweed BDA certification – it assures consumers of consistent nutritional value, levels of iodine, and is rooted in the principles of sustainable food and biodynamic production. Selenium is included as this trace mineral helps with conversion of the thyroid hormone T4 to T3, the latter is metabolically active. L-Tyrosine, organic kelp (Seagreens ® Ascophyllum nodosum)providing iodine, manganese, selenium (from yeast), vegetable cellulose. 1 or 2 capsules daily as a food supplement, or take as directed by a practitioner. Do not exceed the recommended daily intake. This product should not be used as a substitute for a varied diet. Not to be used in pregnancy. People already taking prescribed thyroid medication should consult with their doctor before using this supplement. Wheat; yeast; starch; gluten; soy; lactose; added sugars, colourings, flavourings & preservatives.